Kaiser, David. 2013. “Déjà vu all over again? A response to Philip Mirowski.” Social Epistemology Review and Reply Collective 2 (2): 1-7. It is a great honor to have this opportunity to comment on Philip Mirowski’s stimulating paper, “The Modern Commercialization of Science is a Passel of Ponzi Schemes,” first delivered as the Nicholas Mullins Lecture at Virginia Tech (Mirowski 2012). Most of what I know about the history of economics I have learned from Mirowski’s books, several of which have long been mainstays on the syllabi for my graduate seminars and reading lists for my students’ general examinations. I find myself largely in agreement with Mirowski’s recent essay as well. I share his skepticism of the hype surrounding the explosion of biotechnology start-up firms, and I, too, look quizzically at the kudzu-like spread of “technology transfer offices” across research universities in the United States, with their stark mismatch between promise and pay-off. I found his detailed critique of new instruments like the “material transfer agreement” in Science-Mart (Mirowski 2011) to be similarly arresting, and convincing. It is therefore with some surprise that I find Mirowski introducing his recent essay with an extended critique of my own work (Mirowski 2012, 290-293). I am at a disadvantage in responding to Mirowski’s piece for at least two reasons. First, I have never taken a course in economics. Second, Mirowski has taken aim in his essay at a book I have not yet written. It’s one thing to nod knowingly at the French theorists’ dictum that “the author is dead,” granting, with shrewd smile, that no author can control how others will read a given work; quite another to find one’s authorial self killed off before the book could even be committed to print. Nonetheless, as Mirowski notes, several articles related to my book project have appeared over the years, and it is to Mirowski’s curious reading of those articles that I shall attend. But first I will summarize what I take to be the points of contention. In his essay, Mirowski draws a contrast between what he calls a “Déjà vu” account among science-studies scholars — exemplified, in his reading, by my work — and a “Fictitious Capital” narrative to whose banner he pledges allegiance. As I understand it, according to the “Déjà vu” perspective the violent swings in funding, enrollments, and employment opportunities in the sciences over the past several decades are glossed as nothing more than the undulations of a “conventional business cycle,” unfolding with predictable, inevitable repetitiveness. On Mirowski’s reading, “the Déjà Vu account posits the science studies equivalent of the Efficient Markets Hypothesis.” To adherents of such a view, any misfire of the market for scientific research (and researchers) can be blamed on inappropriate meddling by government officials (Mirowski 2012, 292). In contrast, Mirowski introduces a “Fictitious Capital” account, which detects an inherent sickness or frailty in the recent organization of science, a ticking time-bomb at the core of today’s institutional infrastructure such that “it is difficult to discern how an impending crash of American science can be avoided” (Mirowski 2012, 293). Imagine my surprise to see my work cast as flagbearer of the “Déjà vu” camp, described (by Mirowski) as the structural, perhaps ideological, cousin to stark Hayek-style neoliberalism. Though I do not know any actual economics, I have learned from Mirowski that at least some economists some of the time have labored under a severe case of “physics envy” (Mirowski 1989). So I will play to my strengths and attend to some of the physics-derived metaphors that Mirowski has deployed in drawing his distinctions, such as “simple harmonic motion” and “phase transitions” (Mirowski 2012, 292). Mirowski reads my work as an apologia for the notion that boom-and-bust cycles in the sciences are natural and inevitable, “cycles around some center of gravity through time,” a “simple harmonic motion in a timeless Market” (Mirowski 2012, 292). On the contrary, my work has labored to document how the infrastructure for scientific research in the United States after World War II changed sharply from previous patterns, and was the exact opposite of a simple harmonic oscillator. Simple harmonic oscillators perform with no driving forces; they rock back and forth forever (at least their idealized forms are imagined to do so) thanks only to a (passive) “restoring force,” à la Robert Hooke: displace a pendulum bob and it will endlessly oscillate around its equilibrium position. The “simple” of simple harmonic motion means that context literally does not enter: no environment or medium, no friction or agency. Pace such unforced and eternal oscillation, my historical work has aimed to document the concerted efforts from the 1940s through the 1960s to drive the “pendulum” of science in the United States: to understand how specific policies, which were crafted in particular times and places and contested in their day — not eternally recurring natural motions, nor the inevitable operation of some imagined “Market” — had tangible effects on the pursuit of research and the training of young scientists. To describe such a project, as Mirowski does, as being marred by a “disdain for historical specificity” (Mirowski 2012, 292) is simply preposterous. Changes in draft deferments for science students during the Korean War and huge infusions of federal spending on fellowships and block grants didn’t just happen on their own, nor had they occurred prior to the sea-change in scientific organization that marked the war years and the early Cold War. Scientists and policymakers openly and repeatedly declared during the postwar years that young physics students were a “war commodity” that the nation needed to “ration” and “stockpile.” Indeed, many scientists and policymakers actively sought to construct a centralized command-economy for the sciences, precisely because they feared that the “Market” could not be trusted to meet the nation’s needs for defense (Kaiser 2002a, 2012). This was all playing out against an inflamed outbreak of domestic anticommunism that had an outsized impact on American physicists (Kaiser 2002b, 2005). Both the obsession with “scientific manpower” and the scurrilous McCarthyist attacks on young physicists drew their force from very specific concerns at that time about the “atomic secret” and physicists’ special relationship with nuclear power. Though many new institutional features first took hold in the physical sciences, however, they quickly spread to many other disciplines. By the late 1950s, more academic deans in the United States came from the physical sciences than any other field (Kaiser 2004), further cementing the “new normal” of scientific research centered around federal research contracts. (Forman 1987, Leslie 1993, Lowen 1997, Rasmussen 2002, Mody 2008, Kaiser 2011b). That time-bound constellation of policies and priorities had not always existed, nor would it persist forever. An equally powerful set of policies and priorities coagulated during the late 1960s and early 1970s, driven in part by internal audits in the Defense Department which questioned the Pentagon’s return on investment from funding open-ended basic research on university campuses rather than mission-oriented projects of clear military relevance. The Pentagon auditors were joined by gathering crowds of protesters against the Vietnam War who questioned, amid the tear-gas haze, whether the military had any legitimate place in university life. The onset of stagflation drove further deep cuts in federal spending on defense and education (Kaiser 2002a, 2012). Neither the onset nor the bursting of the scientists’ Cold War bubble was inevitable, natural, or simple-harmonic. The particular arrangement I have sought to investigate —characteristic of many sciences in the United States during the Cold War — did not exist forever. It did not arise spontaneously. And it shaped the types of inquiry conducted therein (Kaiser 2006b, 2007, 2011a, 2012). In short, scientific research and pedagogy during that period were driven by powerful forces that unfolded within a specific (and evolving) political economy. Documenting the history of various policies, their contested and varied implementation, and their effects on the worlds of ideas and institutions is hardly the same as lobbying for an end to government intervention in the scientific enterprise. My clear aim has been, rather, to show precisely how (in Mirowski’s words) “the expansion and contraction experienced by a science is a direct function of the regime of science organization within which it is embedded”—the very insight whose purported omission, Mirowski claims, constitutes the “great flaw of the Déjà vu perspective” (Mirowski 2012, 292). So much for the bogeyman of “simple harmonic motion.” What about “phase transitions”? Mirowski contrasts the Déjà-vu strawman with his favored “Fictitious Capital” narrative, according to which “the sciences as a whole have undergone phase transitions between distinct regimes of science organization and funding over long stretches of history” (Mirowski 2012, 292). I have some sympathy with this notion —indeed, much of my historical work has aimed to understand a particular, influential “regime of science organization” in all its historical specificity — yet there are reasons for pause before adopting the “phase transition” metaphor. On Mirowski’s telling, science in the United States has passed through several distinct regimes or phases, the most recent of which were “the Cold War regime that extended from 1940 to circa 1980, and the Globalized Privatization regime that persists down to the present day.” He is certainly correct to highlight important distinctions between different modes of organizing scientific research, and his brief list of these distinctions is perceptive (Mirowski 2012, 292). My concern, however, is that Mirowski deploys the notion of “phases” as Thomas Kuhn used the Gestalt-like “paradigm shift,” as if the Cold War duck (and cover) had been replaced during the 1970s by a bioengineered rabbit. Figure 1. 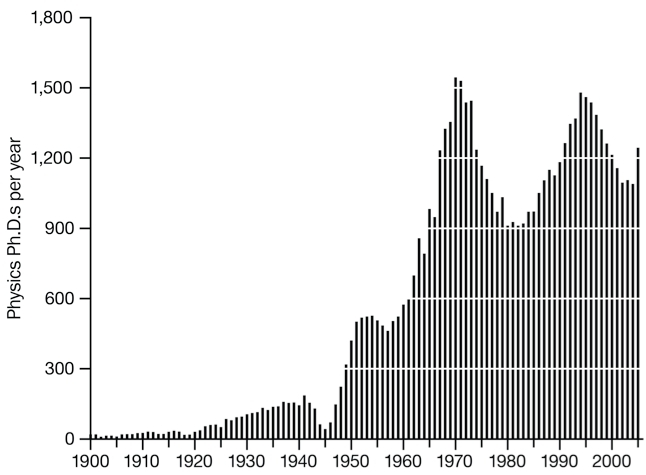 Number of physics Ph.D.s granted by US institutions, 1900-2005. In this sense, I do subscribe to a weak form of “déjà vu,” though more of the Yogi Berra variety than the neoliberal persuasion. As the famed baseball player and pundit had said, “it’s like déjà vu all over again” (Berra 2010, 30). The rapid rise and calamitous fall in the funding, enrollments, and employment prospects for young recruits across the physical sciences and engineering really did look like, and unfold according to, the dynamics of an earlier bubble. All of that was occurring alongside the rapid rise of biotechnology and the aggressive moves toward privatization and commercialization in certain sectors that Mirowski has documented so well (Mirowski 2011, 2012). The “Global Privatization” paradigm didn’t replace the “Cold War” regime so much as mature alongside it, affecting some domains of scientific life particularly strongly while making little discernible impact in others. And even aspects of the biotechnology case may be helpfully illuminated by the physics examples. The annual rate at which new Ph.D.s in biotech were granted in the United States more than quadrupled between 1985 and 2005. The “déjà vu” perspective suggests that we inquire whether such dramatic shifts in pedagogy and infrastructure produced intellectual trends or trade-offs akin to those of the physics bubbles (Kaiser 2008). Even to this day, many areas of science have not been ensnared in the complicated thickets of “material transfer agreements” and the like. Huge swaths of modern science, from astrophysics and cosmology to nuclear physics, (non-extractive) earth sciences, large segments of neuroscience and the like — which command tens of billions of dollars in annual research expenditures and hundreds of thousands of active researchers — are operating neither in a policy vacuum nor in a pre-privatization Eden. They are operating, in large part, under the remnants of a system of organization and patronage that was forged during the early Cold War, built around near-total reliance upon federal largesse. The contrast is not meant to indicate “good versus bad” or “pure versus debased,” but rather to emphasize the limited, hybrid nature of the various regimes of scientific organization at work in recent decades — hardly an evolution of institutional regimes that is well captured by talk of “phase transitions.” I am confident that very few of my colleagues in MIT’s Department of Physics know the slightest thing about “material transfer agreements”; yet most remain well-versed in securing funds from the Department of Energy (successor to the Atomic Energy Commission), NASA, and the Department of Defense. To remain parochial for a moment: throughout the 1950s and 1960s, 96% of MIT’s annual research budget came from federal sources, overwhelmingly dominated by defense-related agencies; 1-3% came from private industry (Kaiser 2010, 105-106). Today, federal contracts still dominate MIT’s research expenditures, though the proportion from industrial sponsors has risen to about 15% (Reif 2010, 2-9; Kaiser 2011b). That marks an important evolution, but hardly a change of phase. We might call this an empirical reason for caution against the metaphor of “phase transitions” when describing recent changes in the organization of scientific research. There is a deeper, methodological one as well. Talk of phase transitions does nothing to clarify the underlying causes or drivers of change. Indeed, physicists’ formalism of phase transitions intentionally ignores questions of dynamics. When applied to historical episodes, talk of phase transitions occludes all questions of agency, of where the gears mesh to change conditions. Metaphors about “phase transitions” might be helpful as description, but fail as explanation. This, in fact, is my biggest critique of Science-Mart (Mirowski 2011), a book I very much admire. As a diagnosis of current malaise, I find the book detailed, sobering, and convincing. But on the question of how we got here — of causes and agency — the book too often dodges the question or slips into a kind of conspiracy theory. Ironically, as best as I can tell, the argument amounts to a kind of “invisible hand”: somehow the pet ideas of a small cabal of neoliberal thinkers forcibly altered an entire, sprawling infrastructure (See also Mody 2011). Mirowski says as much near the conclusion of his recent essay: “much of the move to commodify science is not really driven so much by the profit motive as it is by an ideological crusade” (Mirowski 2012, 305). Ideas alone do not force people to interpret, appropriate, or act in a coherent way. Ideas alone do not radically reshape lumbering institutions like the U.S. infrastructure for scientific research. We must interrogate how certain ideas (and not particularly new ideas, at that) came to seem convincing to particular people in specific times and places; how various people chose to act on them, tamping down variant interpretations, building coalitions, and overcoming inevitable turf battles and bureaucratic inertia. Presumably more was involved than Austinian speech-acts. Neither metaphors of “simple harmonic oscillators” nor talk of “phase transitions” is up to the task of elucidating the complicated, multi-scale dynamics that tether ideas and institutions, and nudge them along. Berra, Yogi. 2010. The Yogi Book. New York: Workman. Forman, Paul. 1987. “Behind quantum electronics: National security as basis for physical research in the United States, 1940-1960.” Historical Studies in the Physical and Biological Sciences 18: 149-229. Kaiser, David. 2002a. “Cold war requisitions, scientific manpower, and the production of American physicists after World War II.” Historical Studies in the Physical and Biological Sciences 33: 131-159. ––––––. 2002b. “Nuclear democracy: Political engagement, pedagogical reform, and particle physics in postwar America.” Isis 93 (2): 229-268. ––––––. 2004. “The postwar suburbanization of American physics.” American Quarterly 56 (4): 851-888. ––––––. 2005. “The atomic secret in red hands? American suspicions of theoretical physicists during the early cold war.” Representations 90: 28-60. ––––––. 2006a. “The physics of spin: Sputnik politics and American physicists in the 1950s.” Social Research 73 (4): 1225-1252. ––––––. 2006b. “Whose mass is it anyway? Particle cosmology and the objects of theory.” Social Studies of Science 36 (4): 533-564. ––––––. 2007. “Turning physicists into quantum mechanics.” Physics World 20 (May 2007): 28-33. ––––––. 2008. “Toil, trouble, and the Cold War bubble: Physics and the academy since World War II.” Colloquium at the Perimeter Institute. http://pirsa.org/0809000. ––––––. 2010. “Elephant on the Charles: Postwar growing pains.” In Becoming MIT: Moments of Decision, ed. David Kaiser, 103-121. Cambridge: MIT Press. ––––––. 2011a. How the Hippies Saved Physics: Science, Counterculture, and the Quantum Revival. New York: W. W. Norton. ––––––. 2011b. “The search for clean cash.” Nature 472 (7 April 2011): 30-31. ––––––. 2012. “Booms, busts, and the world of ideas: Enrollment pressures and the challenge of specialization.” Osiris 27: 276-302. Lowen, Rebecca. 1997. Creating the Cold War University: The Transformation of Stanford. Berkeley: University of California Press. Mirowski, Philip. 1989. More Heat than Light: Economics as Social Physics, Physics as Nature’s Economics. New York: Cambridge University Press. ––––––. 2011. Science-Mart: Privatizing American Science. Cambridge: Harvard University Press. ––––––. 2012. “The modern commercialization of science is a passel of Ponzi schemes.” Social Epistemology 26 (3-4): 285-310. Mody, Cyrus. 2008. “How I learned to stop worrying and love the bomb, the nuclear reactor, the computer, ham radio, and recombinant DNA.” Historical Studies in the Natural Sciences 38: 451-461. ––––––. 2011. “Review of Science-Mart: Privatizing American Science.” Journal of American History 98: 888-889. Morse, Philip M. 1969. Thermal Physics. Reading, Mass. : Addison-Wesley. Rasmussen, Nicolas. 2002. “Of ‘small men,’ big science and bigger business: The Second World War and biomedical research in the United States.” Minerva 40 (2): 115-146. Reif, L. Rafael. 2010. “MIT Reports to the President: Provost.” http://web.mit.edu/annualreports/pres10. Two physical phases (such as liquid and solid) can coexist in equilibrium only if the system’s temperature and pressure are varied in concert, such that the substance moves along the transition line in the phase diagram rather than crossing it. In that case, no phase transitions occur. See, e.g., (Morse 1969, chapter 9). Though my discussion of physicists’ second bubble in (Kaiser 2012, 298-299) had not been published when Mirowski wrote his piece, I discussed the second bubble in some detail — including a graph of the same data as in Figure 1 — in (Kaiser 2008), which Mirowski cited (Mirowski 2012, 307 n10). Private funds play an increasing role in these areas — just count the number of Kavli Institutes in astrophysics and neuroscience around the world, or consider the flourishing Perimeter Institute for Theoretical Physics outside Toronto — but usually in the form of grants from philanthropic foundations rather than “work-for-hire” contracts with strict intellectual-property obligations. Was there an a response to this text?, is very interesting. Cheers from Argentina. Thanks for your question—and thanks for reading. Unfortunately, no, Mirowski did not reply.